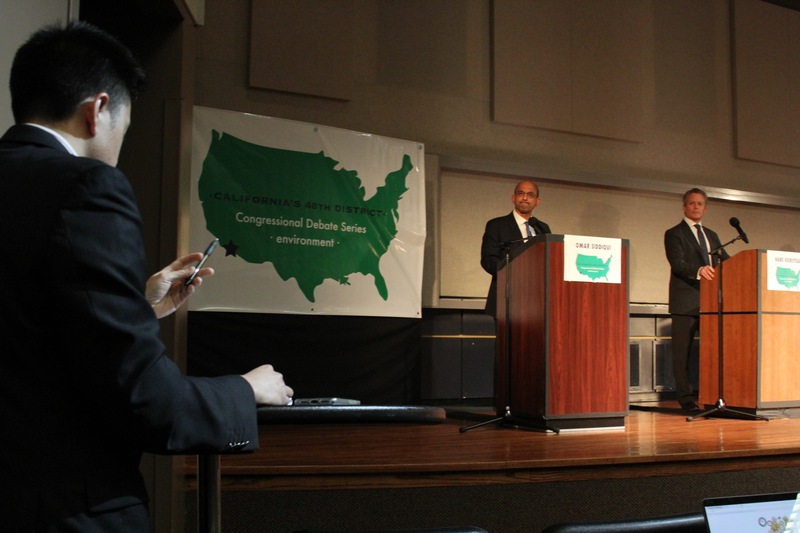 Moderator Mike Young, left, asks a question of candidate Omar Siddiqui. District 48 hopefuls Hans Keirstead and Michael Kotick sheepishly waived red cards, admitting they lack solar panels on their home and buckle up behind a combustion engine car during the third Indivisible OC 48 candidate forum held Tuesday, April 3. In contrast, candidates Harley Rouda and Omar Siddiqui waived green cards, signifying their household’s personal commitment to renewable energy. Both also earned the highest approval ratings among the 48.6 percent of the audience that participated in a non-scientific straw poll afterwards, according to results released by Aaron McCall, Indivisible’s chair. The June primary race for the district that spans Seal Beach to Laguna Niguel remains hotly contested. Voters in 2016 split their ballot, endorsing Democrat Hillary Clinton for president, but returning a GOP incumbent to office. 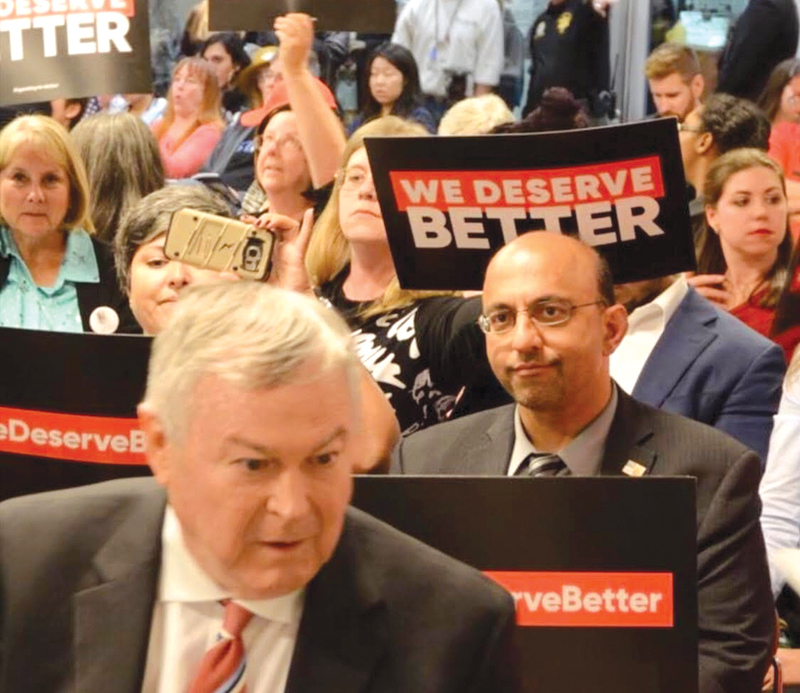 Besides a large but shrinking pack of Democrats who hope to flip the district, Rep. Dana Rohrabacher, of Costa Mesa, also faces opposition from his own party in rival Scott Baugh, former chair of the OC Republican party. In opening statements, most of the candidates bidding to take on Rohrabacher described specific environmental concerns. Siddiqui, an attorney from Costa Mesa, proved the exception, eschewing the assigned topics to call for gun reform and to warn about “a wave of hate” rising among Orange County cities. He described attending a Huntington Beach public hearing this past week where elected officials voted to file a lawsuit against California challenging the legality of the state’s so-called sanctuary law. The law went into effect Jan. 1 and limits cooperation between local police and federal immigration authorities. “The amount of prejudice in that room was shocking,” said Siddiqui, noting that other cities, including Aliso Viejo, intend to consider similar steps. “If we don’t stand up for immigrants, no one will,” he said. Fountain Valley plans to join the suit as well. All of Siddiqui’s rivals at the forum are Laguna Beach residents. Keirstead, a Ph.D. and stem cell researcher, emphasized the necessity of relying on scientific inquiry in drafting public policy, ranging from trade to environmental rules. He reiterated the need to close loopholes in environmental regulations that are waived for fossil fuel producers. “With a red House and red Senate, we’ve lost all hope of a check and balance,” Keirstead said. Kotick, a business executive, pointed out the current administration’s rollback of regulation will help pay for the recent corporate tax cut. “We’re seeing this administration putting a garage sale sign on our most precious resources,” Kotick said. Rouda, also a business executive, said elected officials are needed that acknowledge climate change, its threat to national security and commit to broader use of wind and solar energy. He said for every $1 of federal subsidies provided renewable energy producers, $80 is spent on exclusions that benefit fossil fuel producers. “We’ve got to change the incentives,” he said. Asked about the prospects for disposing of nuclear waste, Rouda questioned the current canisters being used to hold spent fuel at the closed San Onofre power plant. Regardless, he said, storage should not be along the coast in an earthquake zone. “We cannot be irresponsible; we need to come up with a cost effective solution,” added Siddiqui, suggesting a risk analysis would show Death Valley to be a preferable location for nuclear waste storage than within populous Orange County. Rep. Dana Rohrabacher, left, spoke in support of Aliso Viejo City Council’s action Wednesday, April 3, to reject California’s sanctuary city law. A rival candidate, Omar Siddiqui, right, spoke in opposition. Photo courtesy Dan Vo. In answer to other questions, Siddiqui said he opposed a Trump administration review of national monuments that could open federally protected lands to mining, logging and drilling. “These are national treasures that need to be protected,” he said, noting his own involvement in a development battle over preserving Coyote Hills in Fullerton as open space. He pointed out climate change caused disasters, citing hurricane-damaged Puerto Rico and New Orleans. “We have to stop living on this planet like we have another one to go to,” he said. Mike Young, of the California League of Conservation Voters, moderated the forum attended by 380 people, who nearly filled the UC Irvine Student Center. The Left prattles ignorance as if it were pure genius. 1. “Immigrants” is the new “illegal alien.” Will bank robbers soon be called people who make “large withdrawals”? 2. ZEV is a bald-faced lie. Half of the electricity produced in America is made by burning coal, natural gas, and diesel fuel. Moreover, these ZEVs are far more expensive than regular cars, and their high cost is a measure of squandered, wasted resources and energy, just as is the extremely high cost of solar panels. 3. Virtually every ecohypocrite in the room drove their car to the meeting at UCI, so they could boast of their climate change piety. They should have videoconferenced to practice what they preach so piously to everyone else. 4. I am always passed by Toyota Prius’ on the freeway, as they fly by at 80 MPH, using far more gasoline than they would at 55 MPH or even the speed limit. 5. How many of the kiddies at UCI flew or drove hundreds of miles for spring break? Many thousands of them, virtually all of whom preaches *climate change* but practices something very different, as do the pretenders of Laguna Beach, and Irvine, and envirohypocrites everywhere.